Thanks for the background history on the Conqueror, very useful and much appreciated. The idea of goggles is a good one, if I’m honest it’s probably something I’d have overlooked, also the fuse wire suggestion is a good one…I’ll be on to Amazon to see what thicknesses are available. I have always liked the Conqueror ever since I saw one of these behemoths being used as a ‘Gate Guardian’ outside the Ashchurch (nr. Tewkesbury) Army Camp. It was replaced many years back by, what I think is, a MKII Chieftain. I have an idea for a setting, my current thinking for a diorama is to have the Conqueror Tank being reversed out of a ‘dug in’ position somewhere on the edge of a German Forest overlooking the East German border. I’m thinking early or late winter, so damp underfoot, lots of dead/dormant growth, possibly slightly frosty…trying to push myself on this first build back in the saddle after 4 decades, . The idea comes from a novel called ‘Chieftains’ by Bob Forrest-Webb (it’s a good read for those that haven’t already read it). In the book the chieftains are deployed to prepared ‘dug in’ positions that the squadron have only ever visited on foot. The implication being that these positions will not be known to the Russians. The book goes on to explain that during peacetime exercises they use ‘fresh, rough dug in’ positions. I’m thinking that the Conqueror has been out on exercise, dug in, and the exercise has come to an end and the vehicle is being reversed out of its ‘hide’ in preparation for its return to barracks. It is a bit of a leap of faith as I’ve looked in books, and online, for images of a Conqueror dug in but can find none. But as the Conqueror is a big hitter, I imagine it would have been used from prepared fighting positions. If anyone can help confirm, or deny, my thoughts please feel free to comments. Thanks for the good wishes, and it’s nice to hear that you’re finding the build interesting…hopefully not too long-winded, . It’s my first build for a long time and it’s also my first ever build log and I’m trying to do it justice and communicate any lessons learnt. The Conqueror may look like a big beast now, but wait until she gets her claws/teeth, the gun will make the model look huge, . the fuse wire suggestion is a good one…I’ll be on to Amazon to see what thicknesses are available. If you happen to have a discarded set of earphones for mobile phones you could strip down the cable and find thin wires. Assume that the cables for the crews headsets are 5 mm, maybe up to 7 mm, in diameter. In that case you are looking for wires between 0.15 and maybe up to 0.2 mm. Thanks again for the tip, i'll give it a try, i'm certain i'll have old cables somewhere in a drawer. I'm sure it's probably been done either by you and/or others, but it would make a good post subject...a sort of 'Hints & Tips'. Today I thought I’d start work on the gun barrel, just to see how big it is…it’s big, . Below are some images of the gun barrel in sections and the sections joined together. There is a slight moulding seam that runs both sides (can a tube have sides, .) that will need removing carefully so as not to flatten out the natural curvature of the barrel. The seam(s) is/are visible in the first image below. I will include photographs of the cleaned-up seams at a later stage. Whilst studying some photographs of the Conqueror I noticed that the gun mantlet appeared to show a very noticeable seam (see images below). This seam is not incorporated in to the kit parts, now, I’m not implying that this is an oversight on the part of Amusing Hobby, it may well be that seamed and seamless mantlets exist, but, in my opinion it’s a nice detail. I have therefore decided to try and replicate it; the first stage is to build up some material to work on (see images below). Once this material has set properly, I will work on it to give a representation of both the projecting and recessed impression given in the photographs. The topic has been discussed many times but I don't think it has been collected in some easy to find location. Removed by original poster on 01/28/19 - 13:33:34 (GMT). Removed by original poster on 01/28/19 - 13:39:58 (GMT). Thought i'd just have a look at how big the beast is going to be when completed (see image below). It's approximately 13" (330mm) with the turret facing forwards. I'm going to need a larger baseboard than i first envisaged for the intended diorama, . I totally agree, is it something you want to start as you have given me a number of ideas already, how best could it be done? Today has been a ‘busy doing nothing’ sort of day, . Firstly, I decided to have a go at roughing out the diorama idea, I created a plan view in PowerPoint (see image below), it is intended to help me visualise my earlier written description. I then had a go at roughing out the crew member (see image below) who would be standing behind the tank guiding it out of its dug-in position. Repositioned arms and hands using blu tack as a temporary fixative. Finished off constructing the gun barrel and cleaned it up (see image below). I then finished off adding the 'mantlet seam' that I started on yesterday (see image below). Turning my attention to the main turret I added a few parts, then decided to have a go adding some cable to the cable drum. Following the suggestion kindly made yesterday by Robin Nilsson, thanks Robin, , I cut up a couple of old cables with the intention of winding the material around the drum. Firstly, I drilled a hole and then inserted some cable (see images below). However, this cable looked too thick, so I found a different thickness material to use (see images below). Finally, I decided to add the gun barrel to the mantlet and mount it to the main turret. In all the photographs I’ve seen there is a ‘canvas dust cover’ between the turret and the mantlet, however, there isn’t one provided with the kit (I’m sure the after-market companies will provide one in the near future, ). The kit includes the ‘bolted bars/brackets’ that fix the cover in place, these are provided as photo etched parts. Not being prepared to wait, I decided to have a go at making said ‘canvas dust cover’ out of Milliput (see images below). I have left the photo etched bars/brackets off at this stage so that I didn’t cover their detail. When the Milliput is set hard I will clean it up, add some texture and any additional small creases i feel might add to it, and then add the photo etched parts and blend them all together. I know the ‘canvas dust cover’ I’ve created isn’t realistic, and probably not how it would 'gather' in real life but, for me, it’s better than not having anything at all, . Also, on the finished model, I intend to have a camouflaged net strewn partially over the turret and the gun barrel, so this will hide (that’s what camouflage nets do, ) most of the ‘canvas dust cover’. I'm afraid the wire on the spool is actually covered by a sort of canvas sleeve, so no wire is visible at all. There is a sort of tongue and buckle arrangement which secures it, all easy enough to do with a bit of masking tape, an etch buckle or even thin plastic card. As for the canvas mantlet cover, it is a little less rumpled/creased than you depict, as you do acknowledge. Do remember that if you do model a camouflage net it will need to be "garnished" with strips of Hessian - or at least, something replicating that material. The real stuff came in 2 x colours - deep brown and a sort of mid-green - in rolls around 3" wide. They were simply cut to whatever length was deemed appropriate, then weaved in and out of the net, and knotted into the netting. This was an onerous task usually delegated to those soldiers who may have transgressed although equally I imagine, it could have been a crew task. There was unlikely to be much quality control over this process I suspect. For the modeller this is a bit of a challenge. Remember too there would also be the requirement to carry a net that would conceal the whole vehicle when in a harbour area, and this would be secured in the rear turret basket; these old Hessian-type nets (as opposed to the more modern type using plastic scrim panels)were heavy enough when dry, when wet they were an absolute nightmare. PS If you require a photograph of the mantlet cover just PM me with your private email address and I'll get it through the ether to you. Thanks for the information, I have looked at a number of photographs of the ‘mantlet dust cover’ and agree that I’ve gone a little overboard with my use of artistic license, . I am going to have a go today to see if I can resculpt it in to a slightly better representation of the real thing. Looking at the pictures it is generally flatter with the exception of a single pronounced fold...would you agree? I will post pictures of my second attempt for your feedback which, as always, will be much appreciated. I have also been looking at the pictures of the 'cable drum' and, if I am interpreting your description correctly, I can't, yet, see any with a cover. The drum seems to be left exposed as you can readily see the 'spokes' that are represented on the kit part (see image below'. This suggests to me that the cables would be visible unless the cover fits between the two discs that trap the cable between them, so isn't noticeable?...of course, I may have totally misinterpreted your description, ...so any clarification would be greatly appreciated if I have got the wrong end of the stick. You mention about netting, below are a number of pictures that have given me food for thought, the stowed net in the turret bustle basket is shown on a MK2, is this the larger cover you mentioned (I think it looks too small)? If I model this in-situ will it mean I can't show one deployed along the gun barrel as shown in the second image, or would they have carried more than one net? I have also found pictures of a prototype machine with a very substantial looking bundle on the turret rear, is this more likely to be larger cover you mentioned? The wire on the cable drum is what is concealed; the spool sides are uncovered; it's as though a canvas belt is wrapped around the actual wire - in fact that's probably abetter description than my earlier attempt. If you envisage a canvas belt fastened - with a buckle - over the wire itself and aim for something approaching that you'll be spot on. As for the camouflage nets: the main net for concealing the tank itself was secured either in the stowage rack, as shown in your pictures, or secured to the hull rear on brackets (the other pictures showing I should think, a Mk 1 Conqueror). The crew, with an eye for their survivability on the battlefield, would often affix other pieces of netting to their vehicle so you can please yourself what you put on your model, and where. 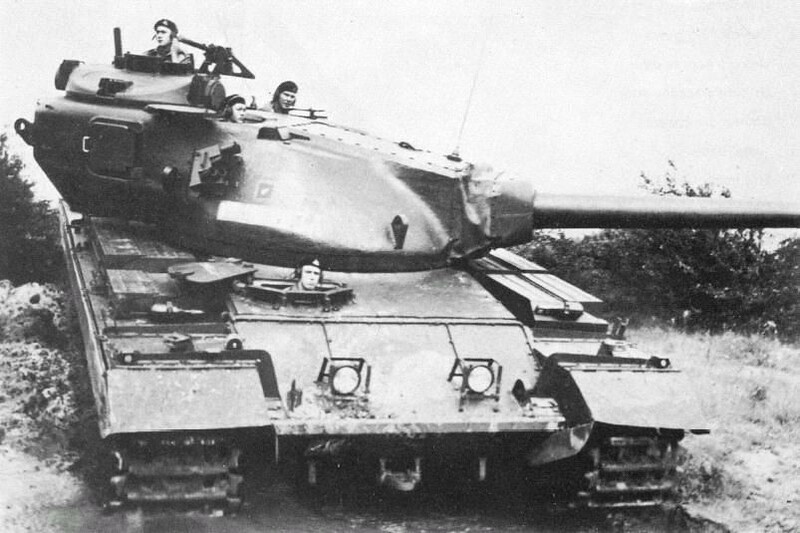 Conqueror was such a large beast and an important weapons system so obscuring its identity on the battlefield would be uppermost on the crew's minds, not lease as their survivability depended on it. Of course, in model form, it's always a bit of a trade off to depict a model as realistically as one can, yet still portray a model - ie have something recognisable on the display tables. On my Dragon Mk 2 I used gauze bandage draped on the model but soaked in diluted white glue to gain such an effect. I then affixed hundreds - or at least it seemed like hundreds - of pieces of Tamiya masking tape to depict the Hessian strips referred to earlier. All very onerous but I got an effect after a fashion. I'm still not quite happy but I'm pushed to see what else one can do in trying to replicate such a net. I've seen it done with rolled out Milliput or similar, but it always looks a little thick to me. 'Quite happy to send you a pic or 2 but I'll need your personal email - I still haven't gotten around to learning how to post pictures on this means. Thanks for the clarification on the cable drum cover, will have a go at modelling something to cover the wire. Below are images of my initial resculpt of the mantlet dust cover, less creased. The Milliput needs cleaning up when it is properly cured but, in your opinion, do I need to work on the folds, etc., further? I'm sure it still leaves something to be desired, it's never going to be spot on, but your feedback is appreciated. Just needed to get it off my chest. The cover is a rectangular (sort of) tube fitted between the mantlet and the turret front. The top piece needs to have enough cloth to span the gap with the barrel fully depressed. The bottom piece needs to have enough cloth to span the gap with the barrel fully elevated. These two measures are the Minimum of cloth required. The side pieces need to match the edges of the top and bottom pieces. Now consider how much cloth is there to "compress" into creases when the gun elevates/depresses? At the max elevation the bottom piece would be almost straight and vice versa. At middle elevation there would be creases both top and bottom. I think you could sand down those creases somewhat. Robin is right - sand down a little and it will just be better (and accurate). I will get carving once the Milliput has cured, . Riffler files, sometimes with the qualifier "diemakers" added. Just watch out that the putty does not contain sand. I ruined a file on Verlindens 2-component putty, the file was blunted by the putty. Coming along nicely. I don't visit the boards nearly as often these days so hadn't seen this. I don't have a set of Riffler files, will have a look on Amazon, they look very useful. Thanks for reading the build.